More than two-thousand miles all the way. 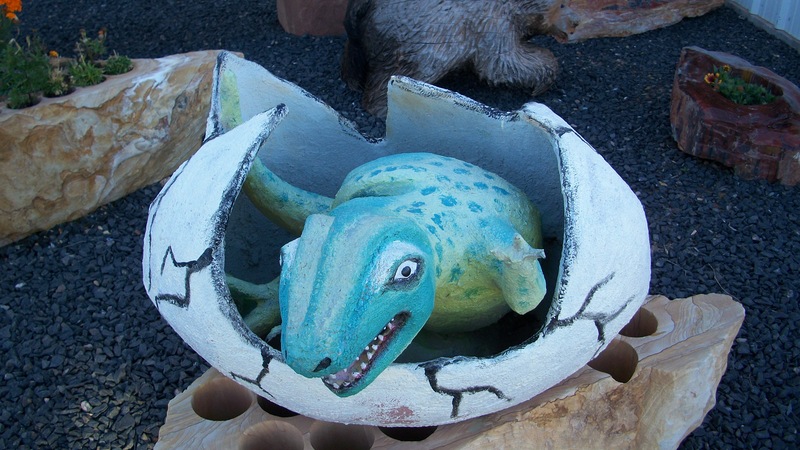 Remember how I went to that dinosaur museum in St George, Utah and they didn’t have any dinosaur statues? I know why! 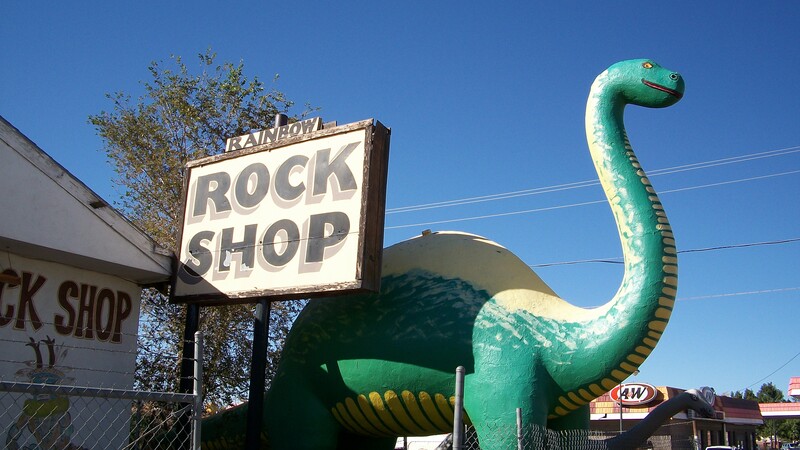 The dinosaurs have all run away to Route 66. 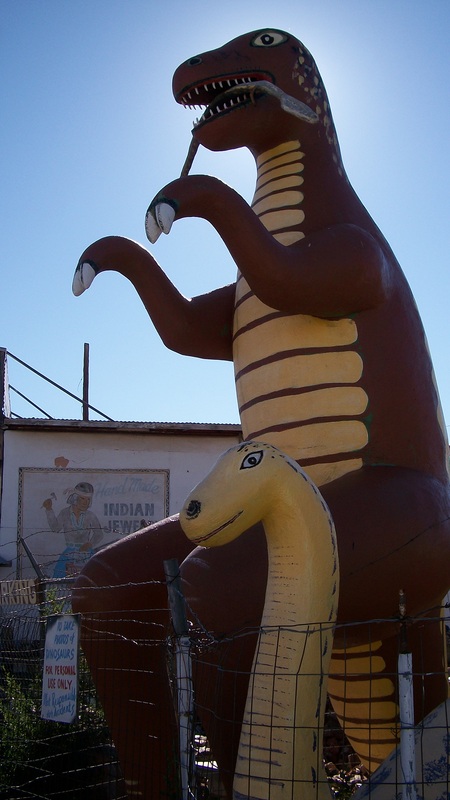 Route 66 is a long treasure-trove of the wonderful, goofy, and uniquely odd sights in America: Dinosaur statues, Wigwam Motels, 2.9 million-year-old alligator in Arizona, Longest Map of Route 66, Standing On A corner In Winslow, Roadkill Cafe, etc. Who thinks of these things?! Oh, how I love this country and it’s quirky marketing ideas! (First) Rock and Fossil Store Owner: I want help promoting my rock and fossil store. What do you have for me? 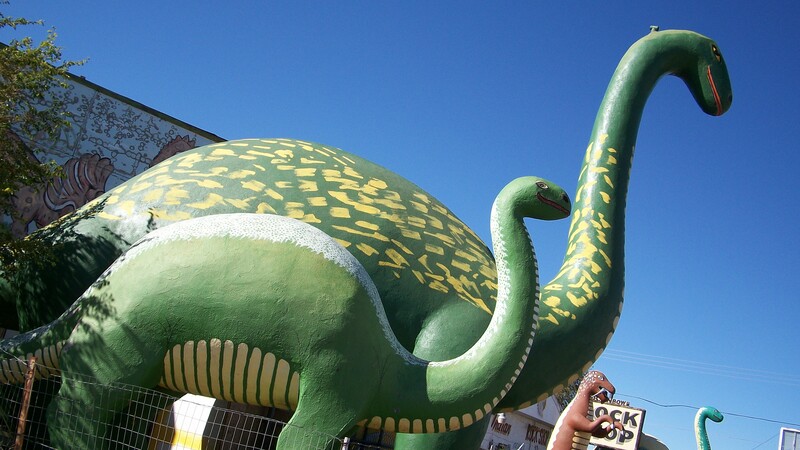 Advertising Agency: We’ll get a few of those large, fake dinosaur statues and place them out front. People will come from miles around just to see your rock and fossil store! Store Owner: Umm, do you mean those big dinosaurs that look like cheezy replicas of Godzilla? Advertising Agency: Yes! Those are the ones. Store Owner: Huh. I don’t get it. Advertising Agency: That’s ok, neither do we. And up went the dinosaurs. Godzilla? Is that you? Umm, no. You must be Godzilla, right? Mmow. What's that? I can't hear you with the mannequin in your mouth. More dinosaur statues in front of a rock shop. The marketing worked because I stopped to take photos. Land Owner: I want to develop my land and start a successful hotel business. What do you have for me? Advertising Agency: Wigwams! We’ll cover the lot with wigwams! Land Owner: Uhh, and why do we want to do that? I told you I wanna start a successful hotel business. What’s that got to do with teepees? Advertising Agency: Err, uh, well… Indians? Yes, that’s it, Indians! Indians used to live here. In fact many still do. If you put up wigwams for hotel rooms the tourists could pretend they were living like the Indians! They’ll love it! Land Owner: I don’t know. Besides, the Indians here now live in houses. 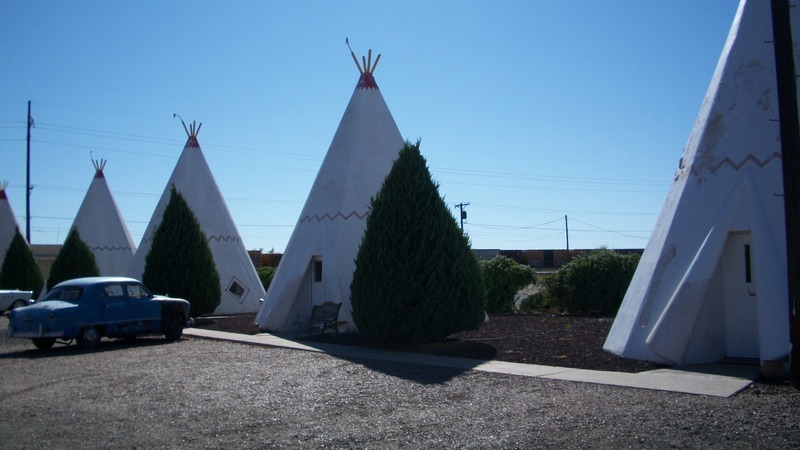 You really think people will want to stay in hotel rooms just ’cause they look like teepees? Advertising Agency: Would I lie to you? And up went the Wigwam Motel. "Mommy, mommy!! Can we stay in a Wigwam, pleeeze?" "Ok, they are kind cute." (Six-hundredth) High-end Rock Shop Owner: Nope, what else do you have for me? Advertising Agency: But why don’t you want dinosaurs? Everybody has dinosaurs in front of their rock and fossil shop. High-end Rock Shop Owner: Exactly. Advertising Agency: Ok, I see you want to be different. You like to set yourself apart from the crowd. 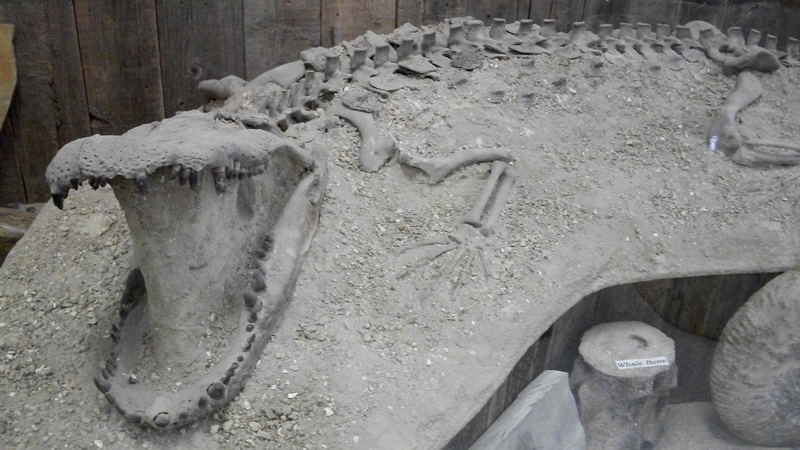 I know where we can get a 2.9 million year old alligator fossil. High-end Rock Shop Owner: An alligator in Arizona? You don’t say? High-end Rock Shop Owner: Well, now that might be ok. It sure would be different. Advertising Agency: Just in case, we’ll put a few token dinosaurs out front. You know, because the tourists expect them. High-end Rock Shop Owner: Right. The tourists. And the alligator was shipped from Florida. Next up… Huge Phallic Rocks, Fertility Deities, Castles, and Voritces. These things might be related. Or not. If those ‘sculptures’ -and I use the term losely- were any cheesier I’d need an extra cholesterol pill. That one with the mannequin looks like it was made of play-doh, in the dark. ‘need a cholesterol pill’ LOL! That shop was waaay out in the boonies, several miles beyond Holbrook. He was pretty much the only thing out there. Old cars were parked in the lot to make it look like he had customers. I felt kinda bad for the guy. He thinks the mannequins will help sell rocks. I’m not so sure. I would have guessed that those were all grade-school art projects. Love this! Those cheesy roadside attractions ate kitschy! By the way, my favorite Depeche Mode song is the route 66 one! Thanks! 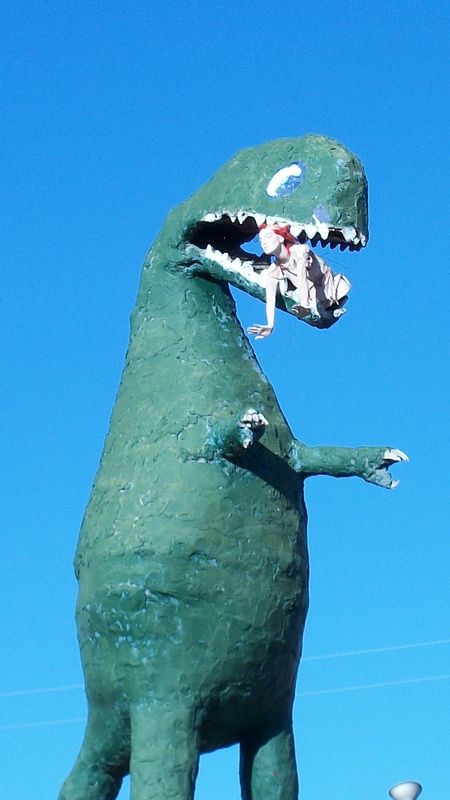 I can’t believe how many goofy roadside attractions are out there! I’m might be seeing about half of the stuff I pass, maybe less. It actually looks the woman in the dinosaurs mouth is much more comfortable than the dinosaur itself! I love your quirky adventure…and only hope you make a soundtrack at the end of all the songs you list and also rock a suitcase full of stickers from all the places you see. Jeane’s last post ..Why do you write? She does look kind of happy, doesn’t she? I’m collecting little magnets of my trip. I like your idea of making a soundtrack of all the songs! I wonder how I could avoid the copyright police? The green one with the mannequin in its mouth? Looks like it is made out of papier mache by fourth-graders. You’re not the only one who thinks it was made by fourth-graders. I’m guessing those native Arizonans rode the short bus. Thank goodness I moved here. love this stuff! you’re doing a great job documenting this trip! I’m glad you’re enjoying it! I really hope to give people an idea of what it’s like in a town, or what the goofy sites are like. They are the best! The goofy sights around the US always make me laugh. I’m collecting little mementos from my travels, either fridge magnets or those flattened coins.